"The oldest surviving prayer to the Virgin Mary was discovered in Egypt in 1917 and contains the second oldest reference to Mary as Theotokos (Greek: God-bearer, Latin: Deipara, Dei Genetrix; English: Mother of God). Here is a modern English version:"
Holy Mother of God (Theotokos). "This remarkable prayer of the late second or early third century first appeared in Coptic and Greek, probably in the great Church of Alexandria. In one form or another, it soon entered the liturgies of East and West and has been enshrined there ever since." There was a fervent devotion to Mary in the third, fourth and fifth centuries in the Eastern Orthodox Church. The Latin West Church was slower to develop Marian devotion and feasts. This Byzantine icon came from this website. Good review about Hail Mary, A Marian Book of Hours here. More about what Catholics believe about Mary here at Fish Eaters. I came across this website, Pew Sitter, while Pope Benedict was visiting. It's sort of a Drudge Report for Catholics, with dozens of links to news stories. The headlines are a bit on the sensationalist side, same as Drudge. Great smattering of news stories of interest to Catholics. 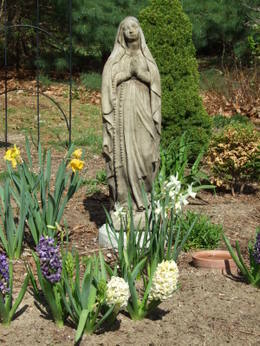 Since the 13th century, May has traditionally been considered the month of Mary, a time of special prayer and devotion to the Blessed Virgin Mary (BVM), the Mother of God. My husband, raised a Presbyterian, doesn't understand the Catholics' Marian devotion. But I don't get why all Christians aren't more devoted to Mary! She completely accepted the will of God, she bore and raised the Christ child, she supported Christ's mission on earth. She's the model of grace, modesty and womanliness. What's not to love? We do not worship Mary, we worship God. But we do revere her. So take some time this month to say a few rosaries and pray some of the beautiful Marian prayers, such as the Magnificat, the Hail Holy Queen, the Memorare and the Litanies of Our Lady. Beautiful hymns at Mass in May too: Salve Regina and Ave Maria. Sancta Maria, Mater Dei, ora pro nobis!